I finally pulled the trigger on a SSD for my Windows PC. I have been struggling with bad reviews on NewEgg’s site with many brands of SSD’s from OCZ, Kingston and other brands. Most of the reviews start out fine but over a 3-6 month period there is an alarming amount of failures. I finally stopped looking at the cheaper SSD’s and went higher up the scale and then I saw the light. 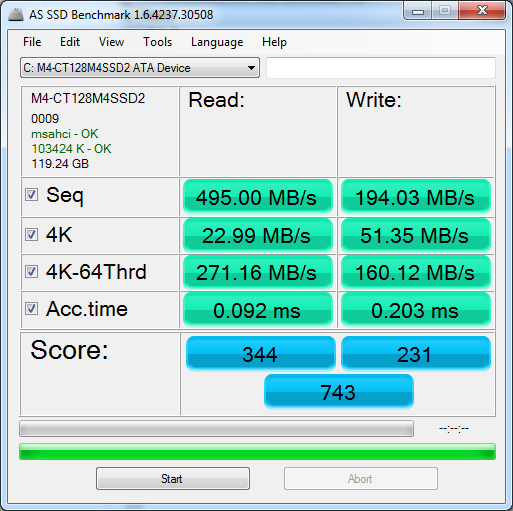 I settled on the Crucial M4 because it supports the SATA III interface and had a lot of solid reviews. Installation was easy. My first step was to update the firmware. I downloaded v0009 from Crucial and burned the boot image to an ISO using ImgBurn. The instructions with the update clearly stated you must disable AHCI in the BIOS for the update to work. It turned out my M4 was already running v0009. But the update process looked to be simple enough for anyone that would get an older version. I put the BIOS back to AHCI and loaded Windows 7 x64 Ultimate from scratch. It took 15 minutes to install the OS with an Intel Core i7 SandyBridge system. I read many articles about SSD alignment. Alignment must be multiples of 64, 128, 256…. Disks that are not aligned will span two blocks for read/writes which causes a significant slowdown. The sad part is most imaging software like Acronis will not work well if you image your current HD to the SSD. The alignment will be wrong which will cause major performance issues with your SSD. Also if you don’t use Windows 7 you have to manually align the SSD. There are many articles out there to cover this process. So loading Windows 7 and all my applications gave the Crucial M4 a good test. I was amazed how fast everything installed. My only issue with the Crucial M4 is they don’t provide any rail mounts for a 2.5 to 3.5 case. Right now mine is just hanging from the bottom of the case, it’s so light the SATA cables make it float.